My kids do and say the funniest things I have ever seen. Also, I have a terrible memory. I will without fail forget every single one of these funnies if I rely on my tired brain alone. So Husband came up with a super easy way to record these funny moments through the years. Thank you, Husband!!! 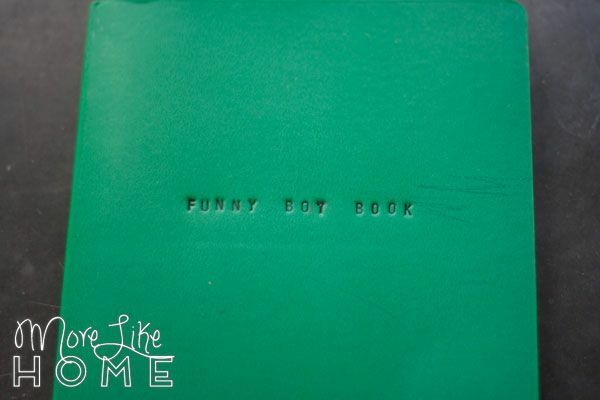 I call them the Funny Boy Books. 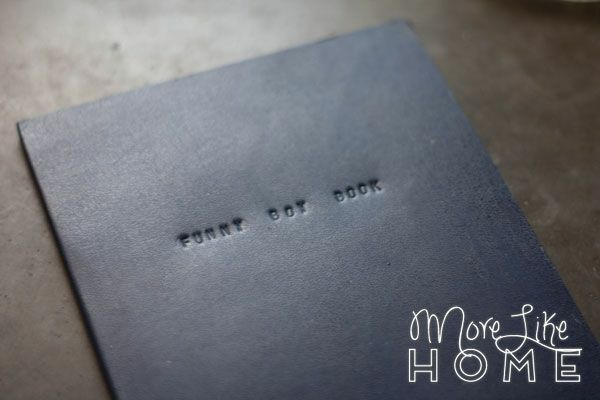 You know, because it's where I write all the things the funny boys do. 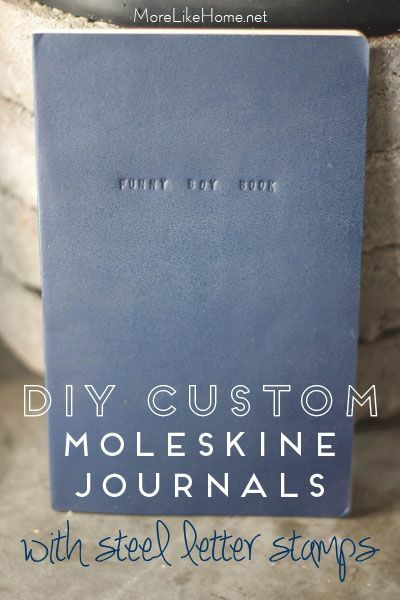 We wanted to make them a little nicer than just a plain notebook since we're hoping to keep them around a long time, so we ordered some Moleskine notebooks to use. Then we used our steel letter stamps to customize the cover of each book. 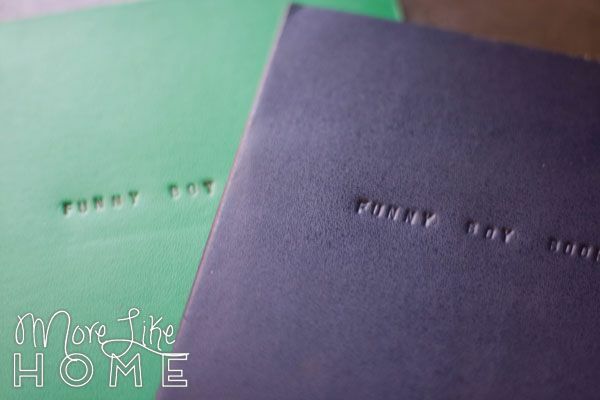 It's a fast and easy way to make their books a little more special! 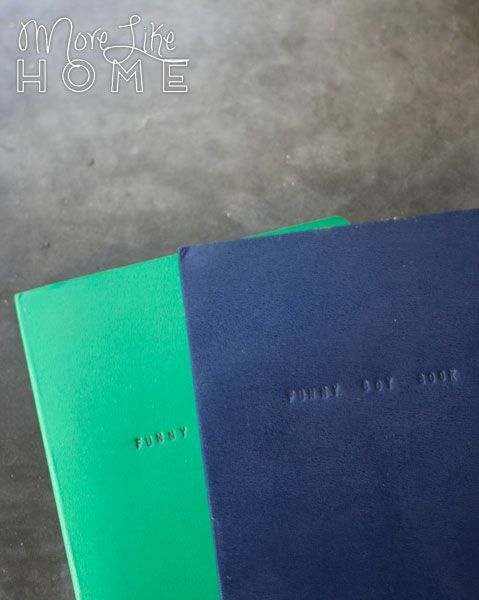 Plus it's great for making customized gifts for new parents. We used our letter stamps to imprint "funny boy book" on the cover of each book (and added their names so we know who they belong to). I keep them on my nightstand so every night before bed I can jot down any favorite funny moments or milestones from the day. I also have a note app on my phone where I write down anything I want to remember to put in the book later. 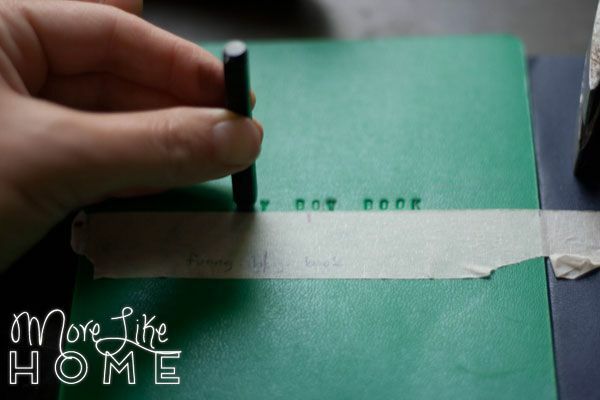 First attach a piece of masking tape across the front of your notebook. Measure down from each top corner (I think I did 3" but you can do whatever distance you like) and line each end of the tape up with that point. You'll use the tape as a guide to make sure your words end up straight. 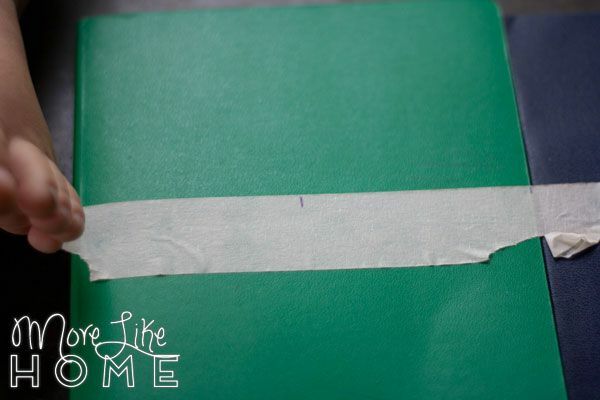 Then measure the width of your notebook and use a pen to mark the center point on your tape. Now you need to figure out the center of the word or phrase you will be stamping. 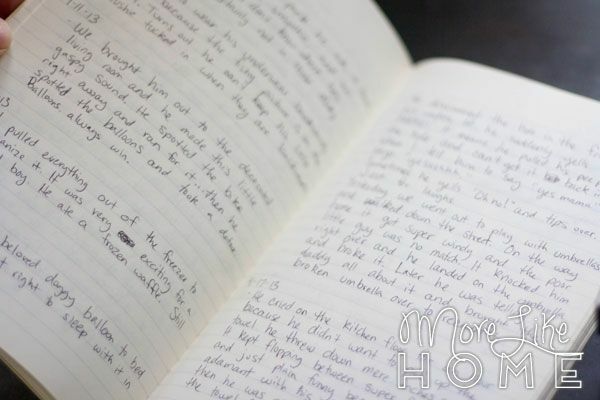 Working from the middle out will keep your text centered on the notebook. For my phrase "funny boy book" the center would be between "b" and "o" which puts seven characters on each side. Make sure you're counting letters AND spaces. 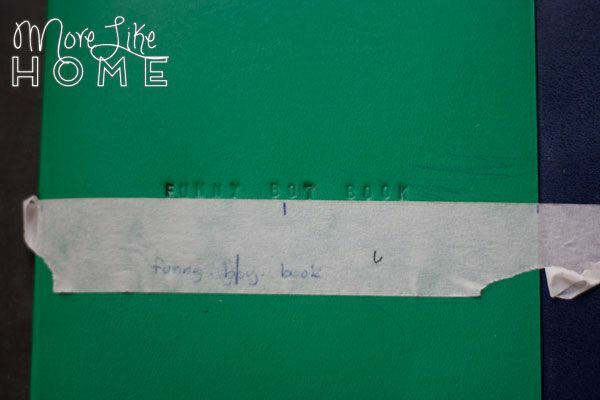 So "funny_b" on the left and "oy_book" on the right. Use a hammer to tap each letter in place, starting with the middle letters and working out. So I started with "b" and "o" on either side of my center mark, then worked right from the "o". Then I worked backwards from the "b" toward the left side. If you want your letters to stand out more, you can use a very fine tip sharpie to carefully drace each letter imprint. In this picture the first letter is traced and the rest are just stamped. And this is it will all the letters traced. Plus some scribbles, courtesy of Big Brother. 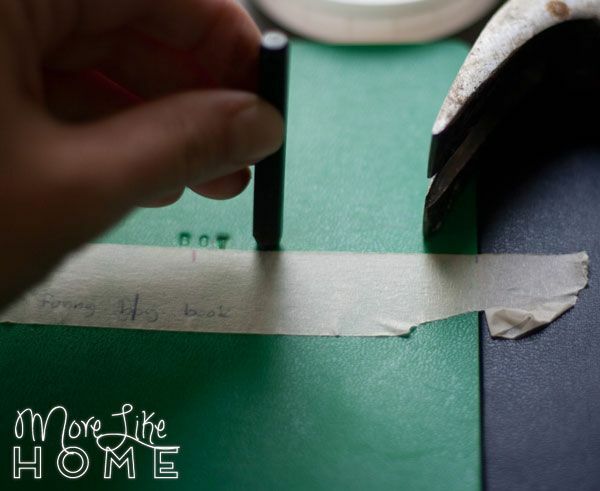 If you want to add a name, just put a second line of tape a little above or below these words and repeat the steps to work out from the middle stamping the name. And don't forget to make one for brother, too! 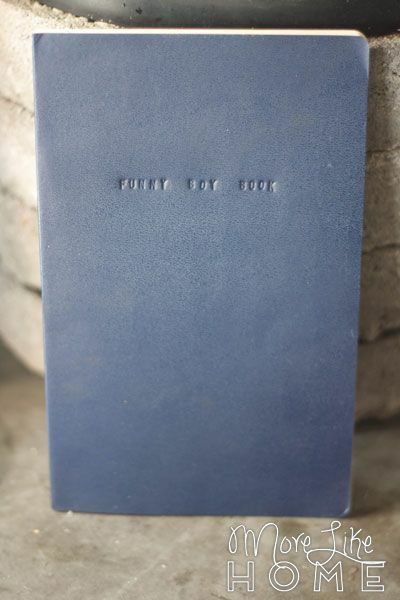 The sharpie didn't make as much difference on the dark blue notebook as it did on the lighter one, so keep that in mind if you want the words to pop more. But it still looks good even without marker! 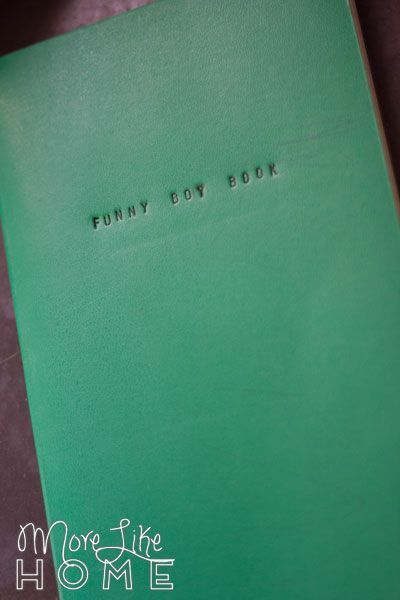 Now you just need some funny stories to fill the books with. Oh... wait... I think I see one now! 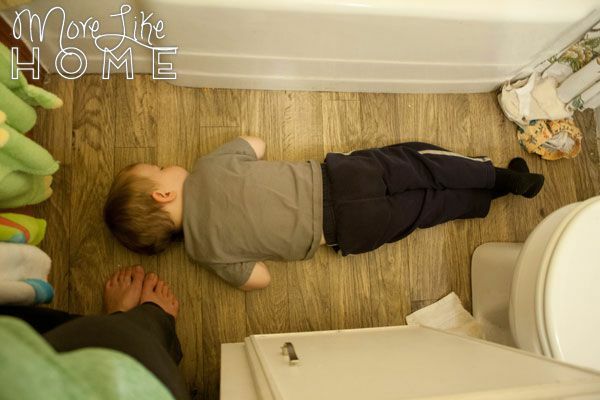 And this might be the best representation of how big our bathroom is. Anyway, in the book it goes! It's a great way to keep track of all the things we want to remember. We already love looking back at funny things from the past. Like when Baby Brother would cry and Big Brother would say "Mommy! Him cry cry cry wah wah wah!" Or the time I was cleaning out the freezer and he ate all the frozen waffles. Still frozen. It takes a few minutes at night, but we will be so glad to have the memories later! 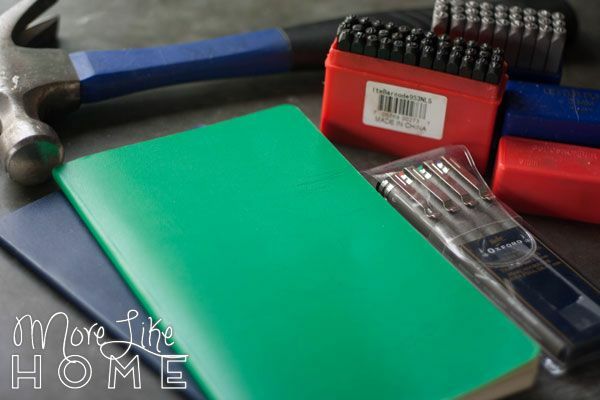 Do you keep any kind of journal for your kids? What's the funniest thing they've done lately?